This entry was posted in Kit, Running and tagged brooks, cascadia, cascadia 9, review, running by MedalSlut. Bookmark the permalink. I approve! The Cascadia are the only trail shoes I’ve tried, but they are in fact my trail shoe of choice. And WOW. 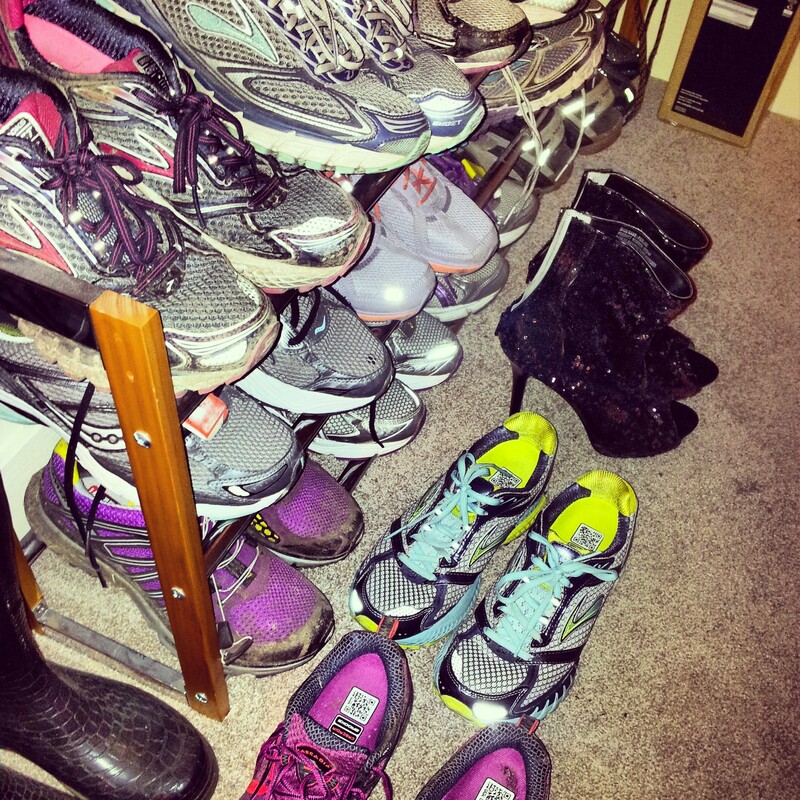 That is quite the running shoe collection! Yeah, Ian seems to think I have too many shoes, but he doesn’t seem to understand the complexity of my collection. I have ‘good’ pairs for races, older pairs for training/muddy days/ trail shoes, shoes that have been retired to ‘gym shoes’, and ones that are only comfortable for certain activities (ie cycling). Justified…… right? That’s one impressive collection of running shoes. Brooks definitely my favourites as well. GTS Adrenaline – and they just keep upping the number. Highly recommended! I tried a few others last time but after about 4 weeks had to go back and get some more. Noted. As soon as they come out in a colour I approve of, obviously. I love the look of some Nike shoes, but they are just not made for my feet. They seem to pinch uncomfortably – I think my once narrow feet are now just too fat! i’ve never tried brooks shoes so far (i usually wear asics & salomon) but i defo want to try the cascadias after having read so many good reviews about them. My only problem is that i live in Greece (europe) and so far no shop has got them (and i mean that literally!!!). only one shop brings brooks shoes in the whole country and they haven’t got the cascadias 😦 Anyway… That means i have to buy them online. Some help about sizing would be really valuable! I wear salomon 7 (european 38.6) in xt wings and speedcross. Do you think i would probably be ok with ordering a 7 in cascadias?? Hmm, had a look at size conversion charts, and a UK7 isn’t really a EUR 38.6, so I’d make sure you’re definitely ordering the size you want. I wear the same size in Salomons and Brooks, though, if that’s any help! Yes that’s really helpful! When you say that you wear the same size in Salomons and Brooks are you referring to US or UK sizing? Anyway thanks again and i wish you all the best with the medal collecting!!! 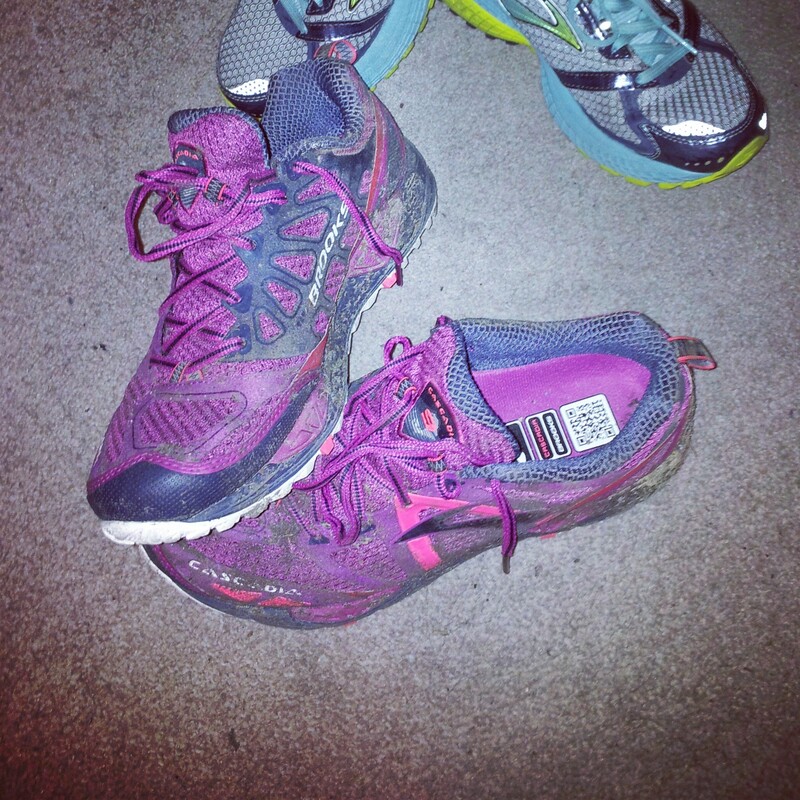 In UK sizing, I wear a size 7 for Brooks and Salomon shoes (though I wear a size 6 for any non-running shoes). I know that Brooks UK7 is a US9, but not sure how that equates to EUR sizes, as all the online conversion charts seem to be different… I hope you end up with the right size! Great review! Love the shoe collection!! I get gyp for having far fewer running shoes than that. I have Cascadia 8s, and I loved them from the off; if I had to choose one pair of running shoes to do everthing, from fell running, through road, trails, and ultras – the Cascadias would be it. Looking at some 9s now. Great review! I have a question, though: do you buy into the whole “dead shoe” theory? Specifically, I have a pair of Cascadia 8’s, which I love, that have between 250 and 300 miles in them. Mix of road and trail. I have a trail half marathon coming up I’d love to wear them in, but my question is how do you personally know when to retire shoes? Even if they look good? Thanks!